The end of April is nearly upon us, and I am already behind in the garden. Late season snows and a book deadline eliminated most of my gardening time this month. As it always does, spring weather finally arrived and eliminated the snowy weather, but the most important change in my schedule results from turning in the manuscript, photographs, and photo captions for Chesapeake Gardening & Landscaping. It has been a labor of love, and although I still have pages to read and an index to write, I am happy the worst is behind me. I am still very excited about the book, and think that it will be a great resource for anyone who wants to garden in the Chesapeake Bay watershed. Readers of Eastern Shore Gardener will be among the first to know when the publisher, University of North Carolina Press, gives us a publication date! Above: Great merrybells (Uvularia grandiflora) a native woodland wildflower. For me, playing catch-up in spring means weeding. I am trying to keep hairy bittercress (Cardamine hirsuta) and ground ivy (Glechoma hederacea) from taking over. 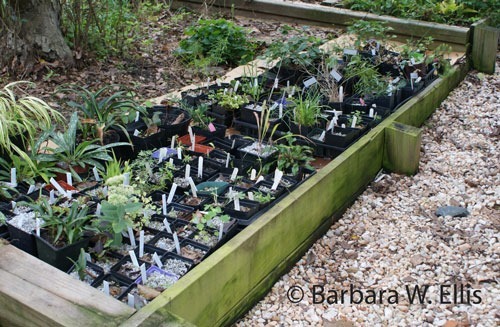 I am also lifting and dividing a few perennials and teasing self-sown seedlings out of the ground for potting up to give as gifts or donate to local plant sales. (You know who you are, shoot me an e-mail!) 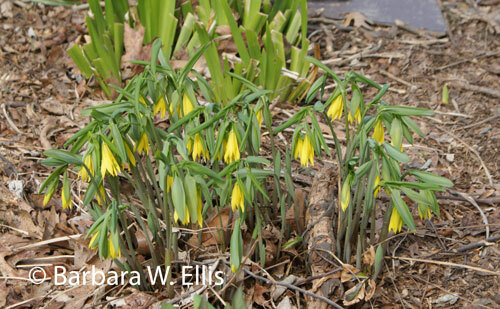 My favorites this year are seedlings of great merrybells (Uvularia grandiflora). My original plant came from my mother’s garden, and it has spread nicely. In addition to enlarging by politely spreading rhizomes, seedlings appear around the original clump. I also have spring beauties (Claytonia virginica) everywhere. These are trickier to dig because their corms are deep in the soil and it is easy to miss them with a spade. Above: This time of year my holding bed is far less neat than this late-summer view. Currently, the pathway in the foreground and all the space up to the tree are crammed with containers. Plus, I am just now getting containers weeded. Another favorite spring activity is looking through my holding bed, which contains seeds sown over several years. I sow in pots, water, mulch with stone (I use coarse chicken or turkey grit), and set them out on the east side of our garage. Some germinate within a few weeks, others take a year or more. All are easy to care for. Loads of perennials and shrubs thrive under this simple regime, and I have germinated trilliums, species clematis, ornamental onions, lilies, butterfly weed (Asclepias tuberosa), hepatica (Hepatica nobilis), and fire pink (Silene virginica), to name a few. A check yesterday revealed that I also have ramps (Allium tricoccum), grown from seed and sets my mother send from our backyard in Ohio. I also bunk cuttings and small divisions in the holding bed, since the site is under a crab apple tree, protected, and within easy reach of a hose. So, with the final manuscript and photos in, I am no longer chained to my computer—at least until the next deadline. As soon as I post this, I am on my way back into the garden to work on my hands and knees pulling weeds and moving pieces of cherished plants around. I am happy to be able to start trying to catch up, and looking forward to writing about what is going on in my garden again! Happy Spring Barbara – and you have been missed. What is a First Friday Chestertown without the artistry of the Ellis-Evans team? A plant donation site?- the local Master Gardeners plant sale is May 3rd in Centreville and I can help dig under your supervision! Your last generous donation of books including the “Veggie Gardener’s –” was purchased by moi and is now about 8 inches “fat’ after being left out in the rain last summer – and still wonderfully useable. Hi Vida! It is great to be out in the garden again. I think the cardinals are the same color they always were. I know I always appreciate them more in spring. I’m a fellow eastern shore gardener and can’t wait for your book! In the meantime , do you have advice regarding dealing with ticks? They just sap the joy of the garden! Just finished your book “Covering Ground” Loved it. I can’t find where the plants on the cover are identified. I am entranced by the ground over under the tree, but alas I do not know what that ground cover is or even what kind of tree that is! If you could identify both I would greatly appreciate it. Hi! Glad you enjoyed Covering Ground! The plants on the cover of Covering Ground are lavender, and the photograph was taken in California, I suspect. Here in the East, I don’t think they would work as a ground cover, although if you have a very well-drained spot for them. This is especially important in winter. You could get a somewhat similar effect with Nepeta, or catmint, here. Nepeta could also be chopped back as necessary with a string trimmer.